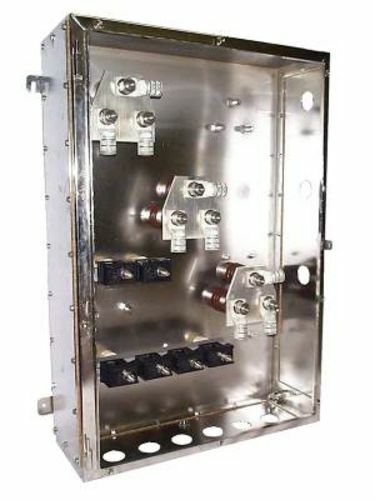 The LR (left/right) Box is designed to allow supply cable to enter and exit at 900 from each other. Supplied complete with three glands plates, its unique design can be modified by the installer to allow either left hand or right hand cable connections. This allows on site configure to suit installation orientation. The LR box is fully ATEX compliant for Zone 1 Gas and Dust environments. It is suitable for voltages up to 3.3kV and can accommodate an overload current 1845A for ten seconds. The standard enclosure is manufactured from 316L stainless steel (EN 1.4404) with a silicon gasket and stainless steel fasteners. The LR also features heavy duty machined hinges with lift off cover pad-lockable cover. It has an orbital finish but painted and electro-polished options also available.